Do you struggle with being a confident grill master because you never really know when your meat is properly cooked? Or the temperature of the grill or smoker you’re cooking on? There are tricks and old wives’ tales for determining the temperature, but none of them seem accurate. Or maybe you don’t BBQ as much as you’d like because you hate having to site by and constantly monitor your pit, to make sure all is going smoothly? You don’t have to live like this. An accurate thermometer makes dialing in those temperatures simple, and a wireless thermometer means you can monitor things from afar while doing other tasks – Like watching the game with your feet up. You don’t have to spend a lot of money to take your grilling confidence up a level while free yourself from being a slave to the grill during long smokes. This guide discusses why you need a grill thermometer, breaks down some of the basic features and how they can benefit you, before we review the following models so you can decide which might be best for you. Why Are Meat Thermometers Important? Why Shouldn’t You Use The Dial Thermometer On Your Grill? Where Should You Place A Grill Thermometer? What Features Should You Consider When Buying? If you are a confident griller, you might be a little offended by our suggestion that you use a thermometer. However, a genuinely self-assured chef understands that food safety is just as important as the way it tastes. Clean your hands and surfaces. Keep raw meats away from other foods. Use a thermometer to achieve the desired temperature. In addition to allowing you to cook your meats to a safe temperature, meat thermometers take away the guesswork. You can spend more time preparing the rest of the meal or hanging out with friends and family when you don’t have to check up on the food sitting on the grill constantly. Thermometers designed for the grill can be inserted into the meat to tell you the temperature of its interior. Most models also have a second probe for use in telling you the temperature inside your grill. When you’re using your oven, you simply set it to a specific temperature. It even beeps at you when it’s preheated. Your grill doesn’t do this. You can only guess at a grill’s temperature if you don’t have a thermometer. Knowing the temperature inside the grill can be vital for fine-tuning your barbecue skills and achieving consistency in your cooks. As you gain experience, you’ll figure out how to set up your grill or how much charcoal to use to cook food efficiently. Using a thermometer will help predict your cooking times instead of just throwing a slab of meat on the grill and hoping for the best. Watch this video to learn more about safety when cooking meat, and why you should use a meat thermometer and how. Some grills come with a dial thermometer on the lid. These analog thermometers have been found to be inaccurate. They can be off by up to 100 degrees in the absolute extremes but are usually out from somewhere between 10 and 50 degrees Fahrenheit. Furthermore, the dial on the grill is usually not placed on the grilling surface. The lid of your grill may register 300 degrees, but the grate is almost always a different temperature. A digital grilling or smoker thermometer will give you a more accurate reading of your grill’s internal temperature right at the grate, where your cooking meat is actually sitting. Have you ever used an old dial thermometer to check the meat’s internal temperature? You stay in suspense as the needle slowly begins to move and picks up speed. Eventually, it settles on the final reading. This can take almost a full minute. A digital thermometer usually delivers a reading in fewer than 6 seconds. It’s more accurate than an analog thermometer. It’s definitely more precise than the dial on the lid of your grill. If you’re gauging the temperature inside your grill, place the thermometer near to and at the same as height as your meat. But not too close! Food develops a bubble of cool air around it, so you want to place the probe at least two inches away from its surface. You should also keep the probe at least one inch above the hot grates. Some thermometers include a clip that allows you to position the probe in the ideal location, about an inch above the grate. If your thermometer doesn’t have a clip, you can encase the center of the probe in a ball of aluminum foil and set it directly on the grate. Foil should not cover the end of the probe. If you’re inserting a thermometer into a piece of meat, take a reading from a few different locations, making sure to poke the thermometer into the thickest part of the meat. Push it past the center. As you slowly pull it out, record the lowest reading. Keeping an eye on the coolest reading will ensure that your meat is cooked thoroughly. Don’t rely on a temperature that results from the thermometer touching the bone. The bone will show a different temperature than the meat. The USDA Food Safety and Inspection Service provide more guidelines about how to use different types of thermometers. Single probe thermometers can only detect one reading at a time. You can’t measure the ambient temperature of the grill at the same time as the temperature of the meat. A thermometer with more than one probe lets you take the temperature of multiple areas at once. Most people will use a dual probe thermometer to measure with one probe in the meat for internal temp and one on the cooking grate to measure the temp of the grill. You could also check more than one piece of meat simultaneously with a dual probe. This is convenient if you’re having a dinner party and your guests prefer different degrees of doneness. But some ‘second’ probes are made just for checking the grill’s ambient temperature and cannot be used for checking the meat, so make sure you know which probes you are getting. Digital thermometers are typically more accurate than basic analog thermometers. And although they do cost more, they’re still relatively affordable. You might as well put your money into something that’s going to save you from wasting it on a ruined meal. Some digital thermometers have a display that’s permanently attached to the end of the probe. If you buy a simple thermometer like this, you have to open the grill every time you check the temperature. This allows heat to escape and can make for an inconsistent cooking environment. My favorite digital thermometers have wires that connect the display to the probe. The display sits outside of the grill while the probes register the heat inside. You can leave the probes in the meat and leave the lid closed while you monitor the cooking. I don’t like to be chained to my grill, especially if I’m entertaining or it’s a hot day. Wireless thermometers let you read the display from a distance, using a receiver that picks up a radio frequency from the thermometer or an app that reads the thermometer via Bluetooth. Radio frequency has a longer range than Bluetooth. Although it might be more inconvenient to carry around a separate monitor, you can mow the lawn or hang out in the basement while you wait for your food to finish cooking, all the time being able to keep an eye on the temps. 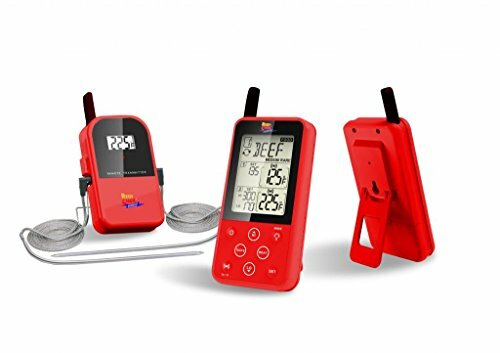 From this point forward, you’ll find a list of contenders for the best wireless meat thermometer, as decided by us after many days of research and using a few of the products ‘in the field’ so to speak. The Thermopro TP20 is an extremely popular thermometer, and you usually can’t go too far wrong by following the crowd. It’s a very rugged, sturdy feeling thermometer. The look and feel inspire confidence that this is a serious bit of kit built with longevity and reliability in mind. It’s a dual probe thermometer, allowing you to monitor both the temp of your cooker, as well as the internal temp of the meat you are cooking. It has presets for up to 9 types of meat and all their doneness levels pre-programmed, so you only need select what you’re cooking and how well done you would like it, then receive alerts as your cook finishes. With this particular thermometer, the probes are rated for 716°F, higher than most other thermometers. It’s orange and black, which is quite striking and a nice look in my opinion. The modules themselves are made of a decently rugged black plastic, and they are encased in an orange rubberised shell, much like the cases you may get for a smartphone. You instantly get the feeling that this thermometer can take a fall in it’s stride and come out unscathed. It has a light grey screen, with black writing, and a backlight button to illuminate the display for reading in the dark that makes it incredibly easy to read. In the box comes a transmitter, a receiver, 2x thermometer probes, 4x AAA batteries and a manual. Everything you need to get going right away is included. 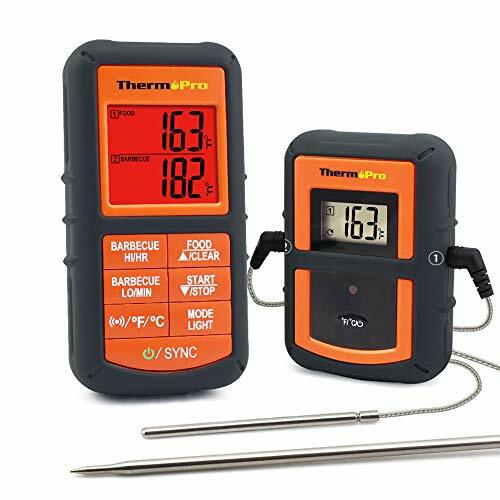 The thermoPro TP20 has 2 ports, one for a pit probe to monitor the ambient temp of your grill, and one for monitoring the internal temp of your meat. You set the desired temperature of your grill, and the desired internal temperature of your meat, insert a probe into your meat and use the provided clip to fix the second probe onto your grill to measure ambient temperature, and then you’re done. The manufacturer claims 300 feet working distance. I can’t say I have tested this distance, but I personally use this thermometer and can say that it reaches from my grill area to my living room, which is perhaps 50 foot and through 3 walls which is impressive! There’s no syncing required, the transmitter and receiver automatically find eachother, and this makes use one step simpler than most. Many presets for different meats and doneness – removes the need to search and setup times and temps. Very robust, looks and feels like it’s going to last. Important as they can go through the wars in frequent use. Compared to many in this list, I guess the lack of a supporting mobile phone app is a downside? But seriously, I don’t miss it, the receiver is plenty good enough. When I started my search for grill thermometers, I knew I wanted something easy to use. Many thermometers come with a lot of bells and whistles. However, I wanted something streamlined. I appreciate the fact that the iGrill 2 has an app that connects to your smartphone. You don’t have to keep track of multiple parts when you’re using the device. Just store the temperature display and the probes somewhere. When you’re ready to grill, pull them out and plug them into the meat. You probably keep your phone close to you most of the time anyway. That’s all you need to read the thermometer from a distance. The Weber iGrill 2 is easy to use and doesn’t have complicated features. Two probes give you an accurate reading of your meat temperature, plus one for your ambient grill temperature so you know what temp your meat is cooking at. 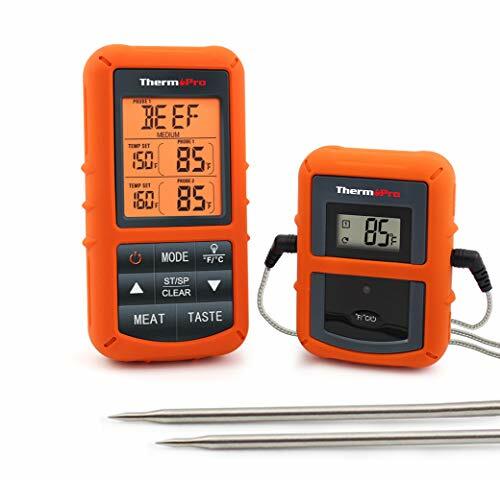 The thermometer has four ports, so you can purchase extra probes separately, and attach them to the thermometer to read the temperature of four cuts of meat at once. Then, you can walk away. The temperature syncs with an app on your smartphone or tablet. The manufacturer claims you can read it from a distance of 150 feet. Many have found the Bluetooth range to be much shorter than that. If there are a few walls between the grill and your smartphone, you can only move perhaps 10s of feet away from the grill. Luckily, an alarm will alert you when the meat reaches the desired temperature. This makes it possible for you to get more distance without worrying about going out of range, so long as you are within hearing distance of your phone. When you’re cooking for a crowd, you can buy two iGrill thermometers and read them on the app at the same time. If you are walking by the grill, there is an illuminated, easy to read display on the thermometer. Because the thermometer sends readings to your smartphone or tablet, no need to fuss with separate wireless receiver. Inputs for four probes let you cook different meats to different temperatures at the same time. Comes with two meat probes. The ambient grill temp probe that can be purchased separately has a clip for ideal placement. The range is limited when you’re out of the line of sight with the grill or indoors. The transmitter is not waterproof. This thermometer can be used in a grill, smoker or oven. It’s streamlined and easy to use in a wide variety of settings. Sometimes I want a little more freedom when I’m grilling. I’ll head across the street to the neighbor’s garage for a game of darts, or I’ll mow the lawn while I’m lighting up the grill. The Maverick ET733 has one of the longest ranges of any thermometers on the market. It’s not as streamlined as a Bluetooth-enabled thermometer. You do have to clip a bulky, red monitor to your belt, but you can walk approximately 300 feet away from the grill. And the bulk makes it feel more robust and durable anyway, important for what is essentially an outdoor bit of kit. The monitor alerts you if you’ve gone out of range, so you know exactly where you can wander. When you go indoors, the range does become more limited than if you’re in a direct line of sight from the grill, which is of course to be expected. But in my house, it works through a total of 3 walls from my bbq area to my living room! If you’re not sure of the ideal temperature for a particular cut of meat, use the predetermined options. The thermometer includes preset USDA temperatures for the following types of meat: Beef, chicken, turkey, fish, pork, veal, duck, lamb, deer, elk, moose, buffalo, rabbit, boar, game birds. You can also customize your settings for your own preferences. Knowing the temperature of the grill is important, especially when you’re following a recipe. If you’re slow-cooking a piece of meat in a smoker, it’s easy to overcook it if the temperature is too high. The hybrid probes can measure the ambient temperature of the grill or be inserted into the meat. I would say it could use more contrast for reading the display during the day in bright sunlight, but this is a small gripe and it’s still perfectly readable. It also has a built in backlight that turns off after five seconds for easy viewing at night. Comes with 2 hybrid probes for measuring the ambient grill or meat temperature. Batteries last long even when smoking meat for 24+ hours. Long range gives you more freedom while grilling. Temperature alerts mean that you don’t have to check the receiver frequently. Can’t measure more than two pieces of meat at once. Receiver is bulky and prominent for carrying around with you. This long-range thermometer is great for setting and forgetting your food. And with it’s ‘meat type pre-settings, ’ It’s also excellent as a reference resource when you’re not sure what the perfect internal temperature is for different meats. I don’t always need someone else to recommend a temperature for my meat. I usually stick to beef and pork, and I’m known for grilling my favorite cuts of steak frequently, so I know them by heart. The Maverick ET732 is similar to the ET733, but it doesn’t have the ability to select from the preset meat temperatures, which in my case isn’t a bad thing. This also makes it a little easier to set up and use. Fewer features make it more straightforward to operate than the more advanced ET733. If I’m cooking a new piece of meat or not sure what’s a safe temperature for it to reach, I can always look up that information separately with a quick google search. This thermometer has the same long-distance range as the ET733, and it definitely seems to be accurate. It seems to have a wider error range than the ET733 according to a few reports. The two probes that come with this model are not identical. The shorter probe is designed to measure the ambient temperature of the grill or smoker. The longer probe can be inserted into the meat. Each probe has a designated input on the transmitter. Comes with one probe for measuring ambient temperature and another for inserting into the meat. 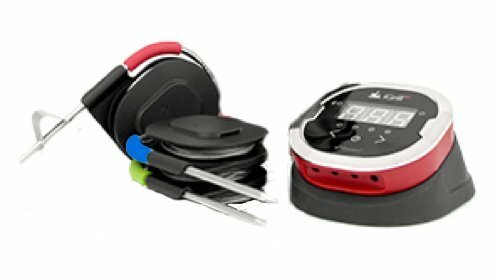 Has an incorporated timer that can count up or down for more accurate cooking. Can’t measure temperature of two cuts of meat at once. Three-foot cables could be more versatile if they were longer. The Maverick ET732 is a streamlined long-range thermometer that’s easy to use once you read the directions. One of the problems with the thermometers I’ve already reviewed is that the probes can start to malfunction. The area where the probe connects to the cable isn’t waterproof. I’ve gotten a little too careless while washing the probes before, making them stop working. The ThermoPro TP08 comes with a lifetime warranty on the probes. The manufacturer will replace the probes for free even if they’ve been damaged from improper use. That makes me confident that I’ll get a little more life out of this thermometer. The transmitter has a hook that lets you connect it to the door of your oven. If you’re using it on a grill, I would recommend setting the transmitter on a shelf or table next to the grill so it doesn’t melt. Fortunately, it has an incorporated stand if you’re setting it next to the barbecue. One thing that makes this unit inconvenient is that the buttons and inputs aren’t intuitive. One button can have multiple functions, and I had to refer back to the owner’s manual to remember how to use it. This shouldn’t be a problem after a couple uses, once you get used to the settings. The inputs for the different probes aren’t labeled, either. I had to check the product image every time I used the thermometer before I decided to label them myself. Timer counts down or up to help you keep track of your cooking. Meat probe is adequately long. Alerts you when you’ve gone out of range. Neither the transmitter nor the wireless receiver is waterproof. Power button is extremely sensitive, making it easy to turn the unit off by mistake. This thermometer is durable in sunny weather. It’s not waterproof, but it is wrapped in a rubber case to protect it from falls and bumps. I don’t always throw large parties that require me to customize meats for different people, but when I do, it’s nice to have a thermometer that does the job. The Morpilot lets you connect six probes at once. Then, you leave the transmitter near the grill and connect to it using a wireless device via Bluetooth. The transmitter is one of the most durable in this list. It’s waterproof, so you don’t have to worry about leaving it outside in the rain. The interface is user-friendly. Once you download the app to a wireless device, you can set it to the type of meat and desired degree of doneness for each probe. That takes the guesswork out of remembering the temperature for several different pieces of meat. Don’t forget to remove the cable wrap before using the probes in a hot grill. Although the cable wrap lets you store the probes conveniently, it will melt when exposed to heat. I wish the probes were color-coded to match the app. A feature like that would push the convenience factor over the top for this thermometer. Six probes give you a lot of versatility when cooking different foods at once. Easy to set up and control using the app. Waterproof transmitter can stay outside in the rain. Bluetooth automatically reconnects if the signal is lost. Bluetooth connection doesn’t reach as far as radio frequency. Plastic cord wrap is not heat resistant. 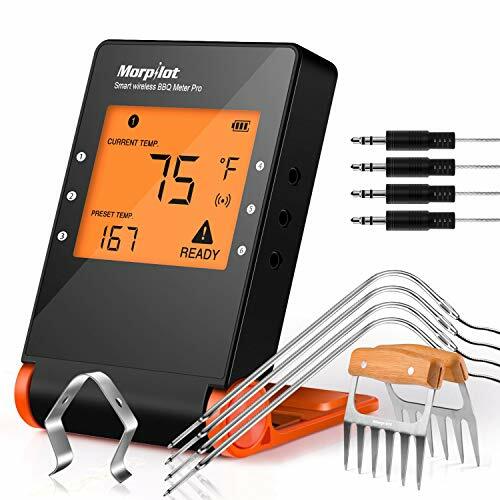 The Morpilot Professional is a durable thermometer with lots of options that makes it great when you’re cooking several items at once. I’ve mentioned that it can be a hassle to mess with multiple thermometer displays. The EliteMeat digital meat thermometer only has one screen. It’s the one you can take with you. The probes connect to a transmitter via cables. However, the transmitter doesn’t have a display on it. It works as a holder for the remote monitor, which can travel anywhere with you. This can be a benefit or a disadvantage. For someone who doesn’t want to mess with multiple screens, it makes monitoring your food more convenient. If someone else wants to check the temperature of your meat, they’ll have to find you to view the remote display. The downfall of this device is that you can only monitor one temperature at once. Although the package may include an extra probe, it’s only a spare probe to use if the original one stops working well. You can’t take the temperature of different cuts of meat without opening the grill. You also can’t check the ambient temperature of the grill. Blue backlit screen provides good contrast day or night. Compact wireless receiver is easy to carry around with you. Limited range that’s equivalent to Bluetooth. The short probe cable is only about 2 feet long. Can’t check temperature unless you have the remote. This is a handy thermometer that doesn’t take up much room near the grill or in your hand. Sometimes, I don’t need a remote thermometer. When I’m entertaining outdoors, the grill is right there anyway. The ThermoWorks ChefAlarm has a huge display that can be seen with a quick glance. If I’m standing near the grill, I can keep an eye on this thermometer. The manufacturer claims that these probes are more resistant to moisture than most others. The connection between the probe and the cable is molded to prevent water from getting in. Although this unit only comes with one type of probe, you can purchase a needle probe separately for better accuracy when cooking thinner cuts of meat or fish. The display registers the temperature within 4 seconds or less, giving it an instant-read quality. The biggest disadvantage is that there is no remote accessibility with this thermometer. If you are dead set on spending time away from the grill, this may not be the thermometer for you. I don’t think this is the best thermometer to use with a smoker that has to operate for hours on end. However, if you want something that works just as well in your kitchen as in your grill for a quick cooking session, this thermometer will do. The temperature cable is safe to use up to 700 degrees, which is higher than most other thermometers. Water-resistant design can sit in the rain or a messy kitchen. Remembers the start temperature and captures the highest temperature reading, which is helpful when you let a large piece of meat continue cooking while it rests. Can’t be moved around with you. Only uses one probe at once, so you can’t measure temperature of different pieces of meat without opening grill or oven. 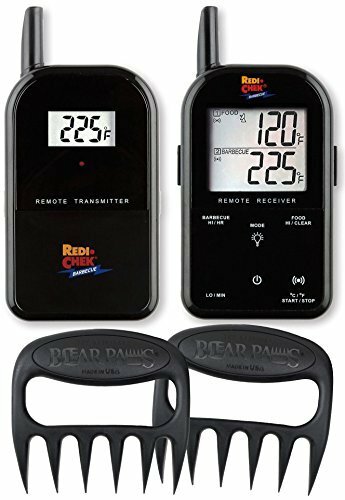 If you just need a thermometer without wireless capability or extra bells and whistles, the ChefAlarm is accurate and reliable. If you spend tens of dollars on a cut of meat that gets overcooked because you didn’t have a thermometer, you might kick yourself. If you do it twice, you’ll be really upset. For the same price as a few good steaks, you can buy yourself a thermometer and avoid this problem altogether. Our most highly recommended thermometer is the iGrill 2. The versatility of taking the temperature of several cuts of meat at once is valuable. I also like the fact it works with an app on a device that I already own. I don’t have to store or keep track of multiple devices or accessories. 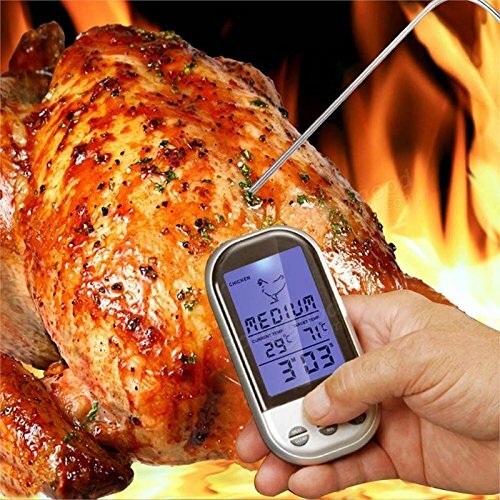 Is it the best wireless meat thermometer for you? Possibly, though if you’re looking for more economical solutions, our tied for second favorites are the Maverick ET732 and ThermoPro TP20. They are fantastic options; accurate, long range, work extremely well and are built to last.